Dany Franchi was born in 1990 in Genoa, Italy and is widely considered one of the best young Blues musicians on the scene today. His soulful vocal tone and incredibly tasteful guitar playing leave’s any audience wanting more. In 2014 he recorded “I Believe” which was recorded in Ohio along with “International Blues Challenge” winner Sean Carney. Between 2016 and 2017 Dany performed at several prestigious Blues Festivals all over the world such as the Blues From The Top in Colorado (USA), Dallas International Guitar Festival in Texas (USA), Blues’n Jazz Rallye in Rapperswill (CH), Olsztyn Blues Festival (PL), Augustibluus Festival (ES) and many others. 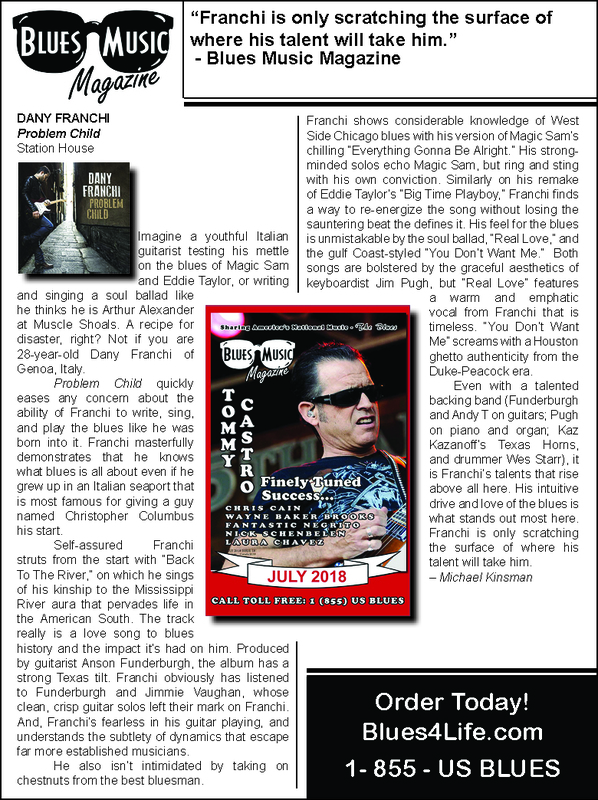 In February 2017 the Texas Blues Legend Anson Funderburgh and Don Ritter of Category5 Amps decided to produced Dany’s third album “Problem Child,” recording at the world-famous Wire Recording Studio in Austin Texas with Grammy® award-winning engineer Stuart Sullivan. The album exudes soulfulness and authenticity, while the respect for tradition is evident, the album also has strong original content, world-class musicianship and a refreshing unique sound.